Jiayu Pass or Jiayuguan (help·info) (simplified Chinese: 嘉峪关; traditional Chinese: 嘉峪關; pinyin: Jiāyù Guān) is the first frontier fortress at the west end of the Ming dynasty Great Wall, near the city of Jiayuguan in Gansu province. Along with Juyong Pass and Shanhai Pass, it is one of the main passes of the Great Wall. The pass is trapezoid-shaped with a perimeter of 733 metres (2,405 ft) and an area of more than 33,500 square metres (361,000 sq ft). The length of the city wall is 733 metres (2,405 ft) and the height is 11 metres (36 ft). There are two gates: one on the east side of the pass and the other on the west side. On each gate there is a building. An inscription of "Jiayuguan" in Chinese is written on a tablet at the building at the west gate. The south and north sides of the pass are connected to the Great Wall. There is a turret on each corner of the pass. On the north side, inside the two gates, there are wide roads leading to the top of the pass. ^ Mildred Cable. The Gobi Desert. UK: Readers Union Ltd., 1950 (1st edition London 1942), pp. 13–14. ^ Turnbull, Stephen (30 January 2007). The Great Wall of China 221 BC–1644 AD. Osprey Publishing. p. 23. ISBN 978-1-84603-004-8. Retrieved 2010-03-26. 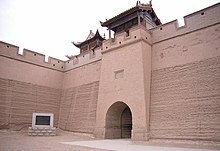 Wikimedia Commons has media related to Great Wall of China at Jiayuguan. This page was last edited on 29 January 2019, at 15:26 (UTC).